Even though I am a huge fan of Korean foods, sometimes you just need a nice taste of home. What better way to hit the spot than to nosh on some deliciously smoked BBQ (no….not the Korean kind). 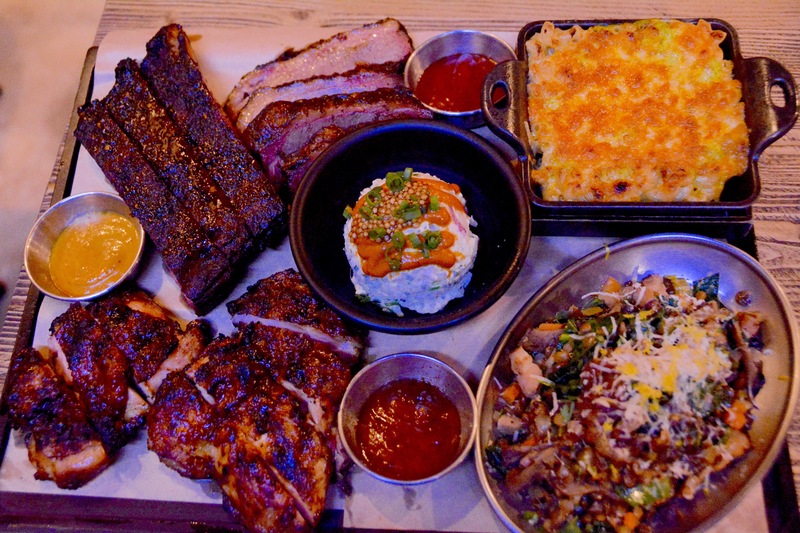 Manimal in Itaewon is a delicious Smokehouse that will satisfy the hungriest of carnivores. Take the subway to Noksapyeong station (use exit 3) and then cross the street towards the Itaewon arch. At the arch go up the hill on your left and you will find the restaurant located on the right hand side (across from Gino’s Pizza). The restaurant is up the stairs and has a very industrial vibe to it. There aren’t a ton of tables, so you may end up waiting if it is a weekend. 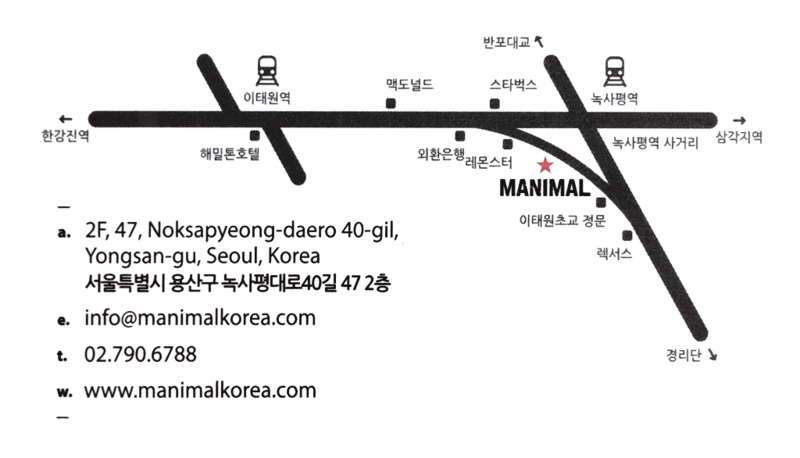 Manimal prides itself on the fact that they smoke all of their meats in-house, daily, over cured Korean oak wood. There are times we have gone inside and the smell of wood chips floods the restaurant. Those are the times we go home and our dog Gomi is really interested in us…haha. While you are waiting, you should definitely check out their menu here. We opted for a 2 meat BBQ Platter (we chose chicken and brisket) which comes with 1 regular side (we chose potato salad), 1 special side (we chose braised bacon mushroom lentil and kale) and 2 honey butter rolls. We added on an quarter slab of the raspberry spare ribs and a green chili mac and cheese for good measure. The total for our gluttony was ₩63,600, not bad for quality ingredients and some leftovers. My favorite thing about Manimal is how they present the food, on a nice wooden slab. They really put together a delicious feast. Usually I’m not a fan of chicken, but their smoked chicken has great flavor and is juicy to say the least. The brisket is rubbed with coffee and always has a great smoke ring on it and is tender as can be. And of course no BBQ meal to me is complete without some spare ribs. Of the sauces, the mustard sauce was my least favorite. I would suggest going straight for the sweet apricot sauce, it is a nice accompaniament to any of the meats (and you’ll be asking for a refill al least once). On to the sides! I was really impressed with the mix of flavors in the braised bacon mushroom lentil and kale dish. It was nice and earthy, but had a bright flavor to it. Scott enjoyed his mac n cheese, of course, but it’s really too much cheese for me to handle. The potato salad was good, but nothing really to write home about in my opinion. Manimal is one of 2 restaurants we run to when we are feeling a hankering for BBQ, definitely try it out for yourself!